The BBC is suspending its newsgathering operations in the Central Asian state of Uzbekistan due to security concerns. All local staff are being withdrawn and the office in the capital Tashkent will close for at least six months pending a decision on its long term future. Regional Head Behrouz Afagh said the staff had been harassed and intimidated in recent months, making it difficult for them to do their job. But he said the BBC remained committed to covering events in Uzbekistan. "Over the past four months since the unrest in Andijan, BBC staff in Uzbekistan have been subjected to a campaign of harassment and intimidation which has made it very difficult for them to report on events in the country," Mr Afagh said. "BBC World Service remains committed to covering events in Uzbekistan, and its English language correspondents will continue to seek access to the country and to report on events there as and when they are granted visas." In June, the World Service correspondent, Monica Whitlock, was forced to leave Tashkent under pressure from the government. Two local members of staff have since been granted refugee status by the United Nations. The Uzbek Ambassador to London has declined an invitation to discuss the issue with the BBC. The unrest in Andijan in May began when a group of men stormed the town's prison and freed 23 businessmen accused of being Islamic extremists. A large anti-government protest was then staged, joined by hundreds of residents as well as the freed prisoners. 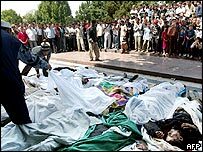 Uzbekistan says 169 people died when soldiers put down the "bandit uprising", but human rights groups believe that 500 people were killed. The Uzbek government has rejected international calls for an independent inquiry into the crackdown. Fifteen men are currently on trial, accused of being behind the protests.